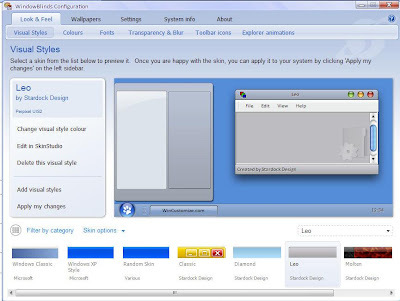 Windows Blinds is a very popular styles and theme editor tool which lets you apply custom themes and styles to Windows on the fly. The software has claimed a lot of popularity over time because of its fast processing and easy usability and one good news for those users who like changing their Windows themes and styles is that Windows Blinds 6 is out and is ready for download. Windows Blinds 6 enables users to personalize nearly every aspect of the Windows graphical user interface. It can skin your title bars, push buttons, Start bar, radio buttons, and nearly every other part of Windows. There are thousands of freely available skins to choose from. Use Window Blinds to make Windows look like another operating system (Mac, Linux) or give it your own unique look and feel. IconPackager has hundreds of different features for enabling users to customize the look and feel of Windows icons.